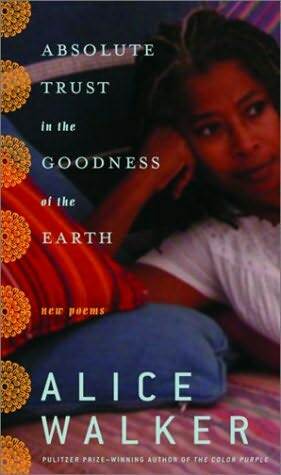 Some of Walker’s fans may feel this way about the author herself, whose decades of literary production and political activism include several bestselling novels, one Pulitzer for The Color Purple, influential essays about social change (most recently, Sent by Earth) and other much-acknowledged work in gender studies and African-American letters. Walker’s poems have long been her warmest, least artful utterances, invoking the solidarity and the compassion she invites her readers to feel: this thick book of short-lined poems extends those goals, exploring and praising friendship, romantic love, home cooking, the peace movement, ancestors, ethnic diversity and particularly admirable strong women, among them the primatologist Jane Goodall. Some poems address topics of recent vintage, such as post-9/11 discrimination (“If you/ Want to show/ Your love/ For America// Smile/ When you see/ His/ Turban/ Rosepink”). Other work continues Walker’s longer-term spiritual and ecological interests: the poet (who subtitled her 1990 collection Earthling Poems) now writes “Divine Mother/ Keep on praying/ For us/ All Earthlings/ All children/ Of this awesome place/ Not one of us/ Knowing/ Why we’re here/ Except to Be.” Though critics’ interest in Walker will continue to concentrate on her prose, the readers across the country who cherished Walker’s earlier poems will find in this new work exactly what they’ve awaited.